Intel announced on Tuesday that it is accelerating the development and deployment of its Internet of Things (IoT) portfolio of products, which enable businesses to turn big data into actionable information. The company unveiled a number of new products and enhancements, including the Intel Atom processor E3800 product family (formerly codenamed “Bay Trail-I”), a family of intelligent gateways with integrated software from McAfee and Wind River, and new features for the low-power Quark SoC X1000 processors. 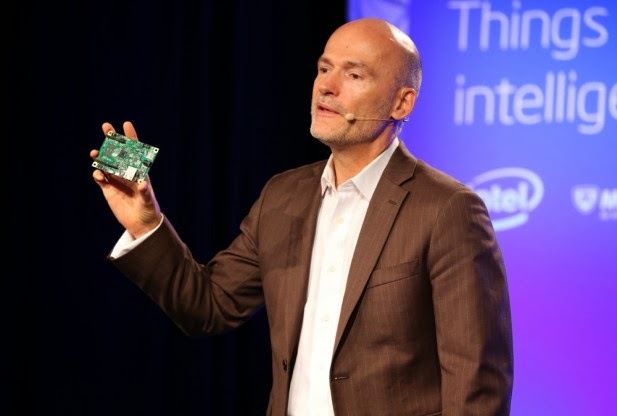 “The Internet of Things consists of a wide range of Internet-connected devices, from a simple pedometer to a complex CT scanner,” said Ton Steenman, vice president and general manager of Intel’s Intelligent Systems Group, during a media presentation Tuesday morning. The number of connected machines has tripled over the past five years, according to a recent report by the McKinsey Global Institute. As more devices become connected, businesses face challenges such as increased fragmentation, interoperability and security. Intel wants to address these issues with intelligent gateways, end-to-end analytics and connection of legacy devices to the cloud. Intel’s new Atom processor E3800 product family offers enhanced media and graphics performance, error-correcting code (ECC), industrial temperature range, integrated security and integrated image signal processing, the company said in its announcement. The chipmaker also launched a line of new gateways – currently unnamed – set to launch in the first quarter of 2014. The gateways will come in two versions, one each based on the Atom and Quark processor. “With more than 85 percent of today’s devices based on existing legacy systems, a significant need exists for an interim step to address interoperability instead of replacing all existing infrastructure,” Intel said. The gateways will include McAfee’s Embedded Control and Wind River’s Intelligent Device Platform to ensure data can be shared securely with the cloud and for analysis. Douglas also unveiled Wind River’s upgraded Intelligent Device Platform – a software development environment for building Machine-to-Machine (M2M) applications and devices that communicate with the cloud. Intel also announced a number of new enhancements to its low-power, small-core Quark SoC X1000 processors, including integrated security, error-correcting code (ECC) and industrial temperature range for industrial, energy and transportation markets. “ECC delivers a high level of data integrity, reliability and system uptime for equipment required to run at all times, while industrial temperature range helps meet the requirements for industrial control and automation applications,” the company said. Intel said the Atom E3800 products are available immediately, while products running on infrastructures with integrated Wind River and McAfee software are scheduled to begin shipping early next year. Read now: Intel intros new Atoms – but can it break into the tablet market?